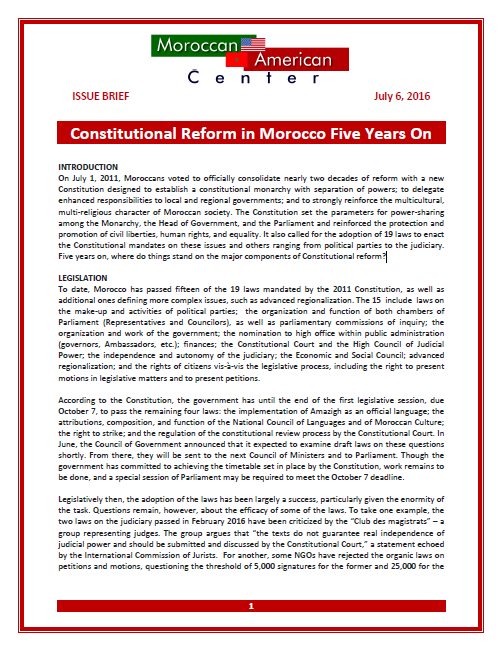 On July 1, 2011, Moroccans voted to officially consolidate nearly two decades of reform with a new Constitution designed to establish a constitutional monarchy with separation of powers; to delegate enhanced responsibilities to local and regional governments; and to strongly reinforce the multicultural, multi-religious character of Moroccan society. The Constitution set the parameters for power-sharing among the Monarchy, the Head of Government, and the Parliament and reinforced the protection and promotion of civil liberties, human rights, and equality. It also called for the adoption of 19 laws to enact the Constitutional mandates on these issues and others ranging from political parties to the judiciary. Five years on, where do things stand on the major components of Constitutional reform?